Accumulating sets is the aim of the game......it's holding onto them that's the trick! Each player is dealt seven cards, from which sets are quickly formed and placed face up on the table. Taking an opponent's set is easy. Just place a matching card from your hand on top and slide the captured set in front of you. But beware: it's not what you take, it's what you keep that counts. 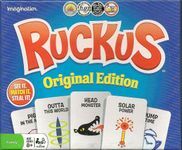 With players matching and stealing sets faster than you can say "Ruckus," until the final card is played, it's anybody's game!